MM is made up of 22 double pages telling the story followed by a page titled “The Legend of Merlin’s Wand”. I’ll name double pages as P2 for pages 2 and 3, P4 for pages 4 and 5, etc. “The Legend of Merlin’s Wand” is P46. Each double page has a border made up of 48 squares all around the outside edge. The squares are clearer on some pages than others. Near the top middle of P4 there’s a large butterfly filling a square. I’ll call that “square zero”, or S0, for reasons that will become clear. Going clockwise, I’ll number the squares S1, S2 etc, all the way round the page until reaching S47, which is the square immediately to the left of the butterfly. Check out my beautiful picture! Using this numbering system, I can quickly refer to any square in the book. For example, P34,S34 is the left middle square on the double spread at pages 34 and 35. If you go look, this square contains a white rabbit. Every page of MM is filled with symbols, both around the border and scattered inside it. The sheer number of symbols is what makes the puzzle both intriguing and impenetrable! Small gold and silver symbols are found inside the border and copper-coloured tiles etched with more symbols go around it. There are also seemingly random objects like planes, cups and clocks (and rabbits!) filling individual border squares. I’ve put some silver and gold symbols and two random green objects in the image above. These are just things I’ve made up as examples and aren’t really in the book. The symbols in red in the image are taken directly from the book. They are examples of zodiac symbols that appear through the book, sometimes disguised within a larger object. The Taurus symbol is on P6,S4 (double page 6-7, square 4), for example. The puzzle is to identify (a) the Alchemist’s spell and (b) the method of casting it. These are key plot points in the story. To win the competition, these two elements had to be drawn on a piece of paper. This suggests that the solution is made up graphical items rather than words, i.e. the seemingly random objects placed in the border squares are the pieces of the solution. From this, it can be guessed that solving MM requires identifying a sequence of border squares through the book. This gives a sequence of objects and these objects represent the spell and the method of casting it. The question is therefore: how to find the correct sequence of squares? The official solution says that MM contains many hints to the correct method. There are several objects throughout the book which start in one square and point towards another. Some of these look 2-dimensional, some 3-dimensional. The two planes shooting each other on the right of P10 is one striking image, the knight’s lance crossing P18 is another. The best hint, to my mind, is the main image on P38 where the sorcerer and Nimue are firing bolts of lighting across the page. Nimue’s bolt hits Merlin and the sorcerer’s hits an object on the border. 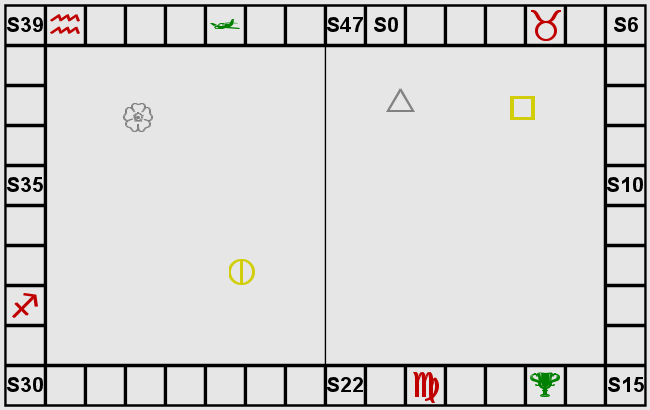 From these clues, people were supposed to realise that lines were supposed to be drawn “in 3D” through the book from a starting square on one page (represented by Nimue), through a symbol on a second page (represented by Merlin), to a final destination square on a third page. I say “supposed to” because the author says nobody worked out this key part of the puzzle during the 3 years the competition was running. Many of the different elements of the solution were cracked, but putting the individual pieces together eluded everyone. I think this is a major failing in the creation of the Merlin Mystery as a coherent, solvable puzzle, but I won’t dwell on it. In writing this solution, I will just point out what I think are the clearest hints in the book. Some of these hints are confirmed in the official solution and some are my own thoughts. It’s a cryptic puzzle, so different people will have their own opinions. This brings Part 1 of the Merlin Mystery solution to an close. If you’re unfamiliar with the book, or haven’t looked at it for a while, browse through it before moving on to Part 2. A lot of time is spent flicking back and forth through the book, so it’s worth being familiar with it. As a first step, find all of the large zodiac symbols in the border squares. I think there are 6 in total. You’re looking for those which occupy most or all of a border square, so ignore the small ones etched into the scattered copper-coloured tiles. Part 2 will go through all the different symbols that are important to the puzzle.